Closed some time early 2012. Re-opened as The Old Frizzle which doesn't have a listing yet. If you are on a year out in England and spend your time slagging of the crap weather not like back in Aus, then this is the pub for you. Absolutely awful for everyone else. You'll get more culture in a yoghurt than you would in this place. Carly Simon?? Linda Ronstadt??? You into necrophilia or something? If Carly Simon, Linda Rondstat, Patsy Kensit and Samantha Janus all rang me up begging for a serving up cos the were gagging for it and it had to be at the Billabong bar, Wimbledon then I'd still not turn up. 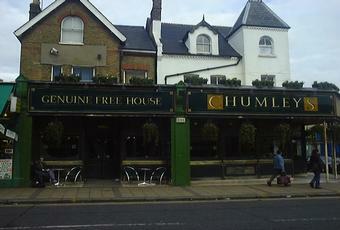 This is as far away from being an english boozer as you can possibly get. Donate it back to Kevin Dunn, the Prisoners of Cell Block H, The Sullivans, INXS, Angry Anderson, O.N.-John and Ned Kelly and their likes as those pxxy hand wash supping ex convicts from darrn uuuunder mate seem to like this inane liquid pig sweat. Oh yes if Barry "DAME EDNA" Humpreys turns up then someone left hand the unfunny clout head. 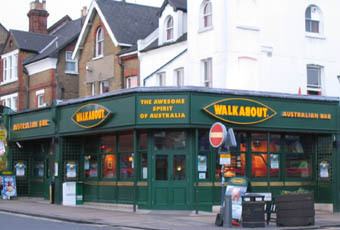 Now called Billabong Bar but is an exact clone of the Walkabout it once was.